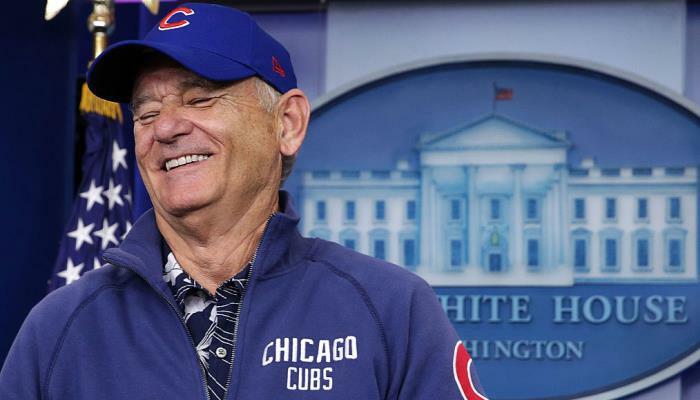 Why Did President Obama Pay $5.00 to Bill Murray? President Obama made an appearance on Jimmy Kimmel Monday night and was his usual classy yet hilarious self. He read mean Tweets and talked about the Cubs’ win and what happened when Bill Murray visited the White House. Since Obama’s words always cause a buzz, people are asking questions about the show to see highlights from what they missed. Here is why President Obama paid $5.00 to Bill Murray. Although Obama is a White Sox fan, he is still cheering on the Cubs because they are his home team. The Cubs made history by reaching the World Series on Saturday—this is the first time they’ve made it this far since 1945. Obama tweeted his support for the team. The replay of Monday’s episode is available on Jimmy Kimmel’s YouTube channel, be sure to check it out to see more clips!